I'd pretend that this lamp was inspired by Anthropologie, but really, it was all Mandi from Vintage Revivals. 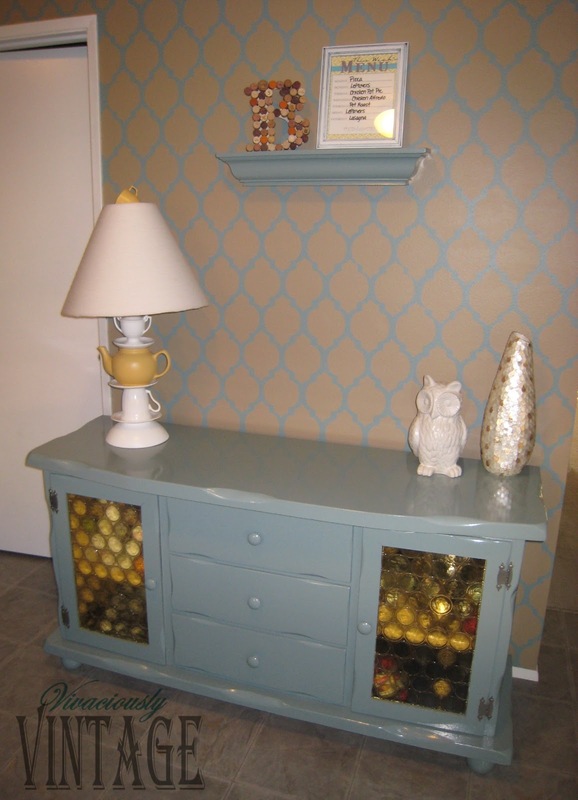 I liked her lamp way better than the one from Anthro, and my buffet needed a little something since I moved all of my vases to the top of the fridge! I followed Mandi's tutorial on how to make the lamp. I'll say that mine is not tight and secure like she says hers is. Mine wobbles some, even though I have a washer at the bottom - I should have used rubber washer in between each dish. Oh well, maybe I'll add that on one day. I ran into sooo many hangups making this lamp! I drilled the holes in the dishes first, then spray painted them all. Initially I was just going to glue them all together, but then I figured out that I needed a lamp pipe to screw the light bulb holding portion to (I know I'm crazy technical here). So, back to the store to buy one...then it's crazy long and I didn't have the right saw to cut it! 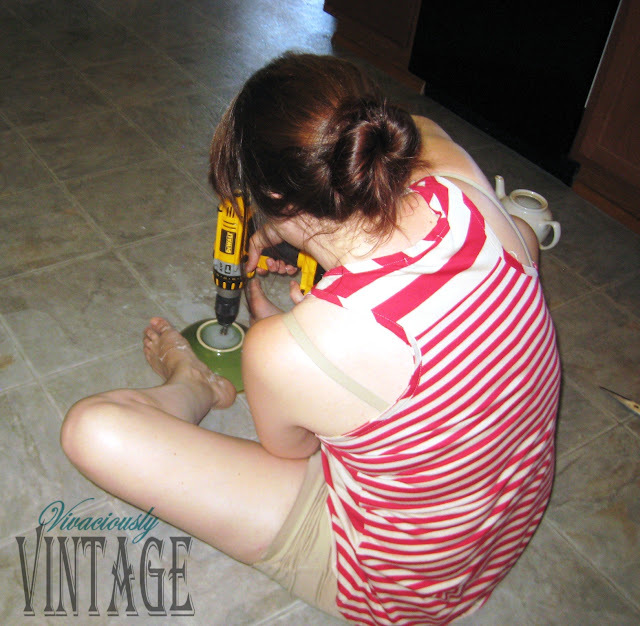 By this point I was so sick of going to the store for things that I kept figuring out that I needed that I just took apart another lamp and used the pipe from in there! It's probably a little shorter than it should be for my lamp, which might account for some of my wobbliness. Edit: I was able to tighten it a bit more and it's very sturdy! No rubber washers needed! Who needs clamps when you have feet?! 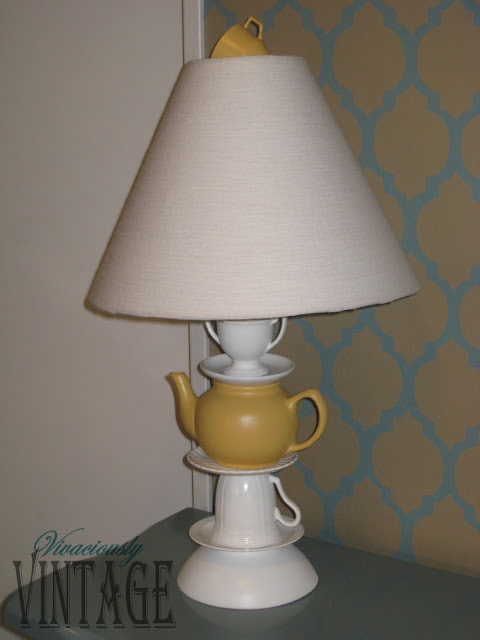 The lamp shade I revamped from an old one that belonged to my husband's father. 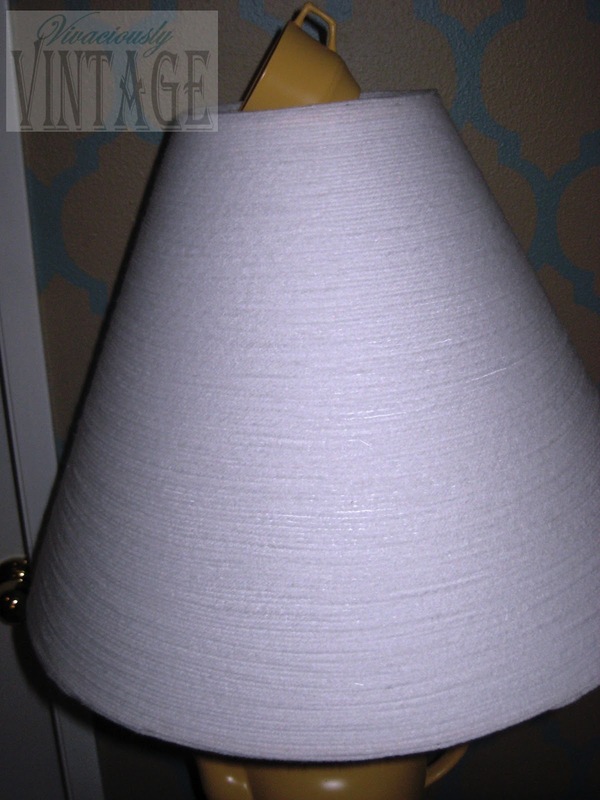 It was the perfect size for the lamp, but I wasn't feeling the aged yellow color or the pleats! So, I just wrapped the entire thing in white yarn. It actually didn't take very long. Maybe 30 minutes? It's rather straightforward, just be sure for the first wrap around that you are starting, to hot glue the entire thing so it stays put. After that, I put it very sparingly just for good measure. Might not have been necessary at all until the last layer, which I glued completely also. I'm not posting a tutorial on this one since I followed Mandi's completely. I tried to deviate from it and it just caused me problems! So follow hers! Here's my new lamp all happy on the buffet. I'm loving all my new kitchen changes! Check out that DIY menu here. I updated the lamp shade! Found a cheap brown one and sprayed it white! I like the shape much better. 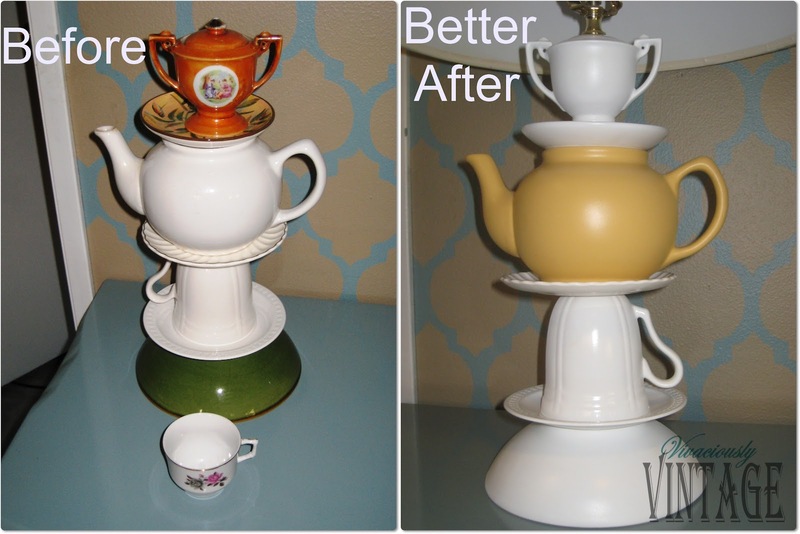 Check out the teapot lamp that I made for my sister here! Oh man, I feel your pain! I still haven't updated all my watermarks from my name change. I can't imagine having to completely move EVERYTHING! Why the move? Is it that much better than Blogger? I love this lamp. I have a link party on Wednesdays, and I would love it if you would link this post. It is called Wednesdays Adorned From Above Link Party. What a cute idea....love it!! !